Screw loosening is the most common factor associated with dental implant failure. One of the major cause for screw loosening is the “loss of preload”. Several factors including screw geometry, material properties particularly stiffness, surface texture and condition of mating surfaces, degree of lubrication, rate of tightening, integrity of joint etc. Objective: This review analyses the factors that are responsible for the loss of preload. Material and Methods: Screw geometry, Implant- Abutment Connection type (external hexagon platform, morse taper), Material properties viz Stiffness, Resilience, Materials viz gold, titanium, titanium alloy, Surface texture of the abutment screw, Condition of mating surfaces, Lubrication, Torque value, Rate of tightening (10, 20, 35N and retorque after 10mins) are taken into consideration in this study. The MEDLINE-PubMed database was searched from September 2016 to 10 years previously. Several journals were hand searched and from cross references. The outcome analysed are the factors that are responsible for loss of preload. Results: The search yielded 84 articles. After excluding duplicated abstracts and applying the inclusion and exclusion criteria, 36 studies were eligible for analysis. The result shows that loss of preload can occurs depending upon the type of material used, torque method, torque sequences, abutment connection type, influence of lubrication, abutment collar length. However we detected some potential limitations in the studies selected, mainly a minimum number of samples used for the study. Hence we suggest further studies to guarantee an excellence in methodological quality. Conclusion: Based on the available data it can be summarized that the knowledge of preload loss must be known for the clinicians to avoid such screw loosening and subsequent implant failure. Primary stability in dental implants is an essential factor for achieving successful osseointegration. Surgical procedure and bone quality are among the most common factors that affect primary stability. It is also crucial to achieve high-insertion torque which is important for obtaining primary stability. Maintaining sufficient bone bulk and density is essential to achieve necessary bone-to-implant contact for obtaining a biomechanically stable implant. A new concept for osteotomy called osseodensification (OD) has been at the forefront of changes in surgical site preparation in implantology. This relatively new concept with universally compatible drills has been proposed to help in better osteotomy preparation, bone densification, and indirect sinus lift and also achieve bone expansion at different sites of varying bone densities. This procedure has also shown improvement in achieving better implant primary stability and better osteotomy than conventional implant drills. A systematic review was undertaken to analyze if OD procedure had any advantages over conventional osteotomy on bone density and primary stability. An electronic database search was conducted in PubMed using keywords such as “OD,” “implant primary stability,” “implant bone density,” and “implant osteotomy.” A total of 195 articles were collected and subjected to screening using inclusion and exclusion criteria. A literature review was done, following which it was seen that the use of versah drills for bone OD resulted in undersized osteotomy compared to conventional drills. It also resulted in improved bone density and increase in percentage bone volume and bone-to-implant contact, thereby improving implant stability. 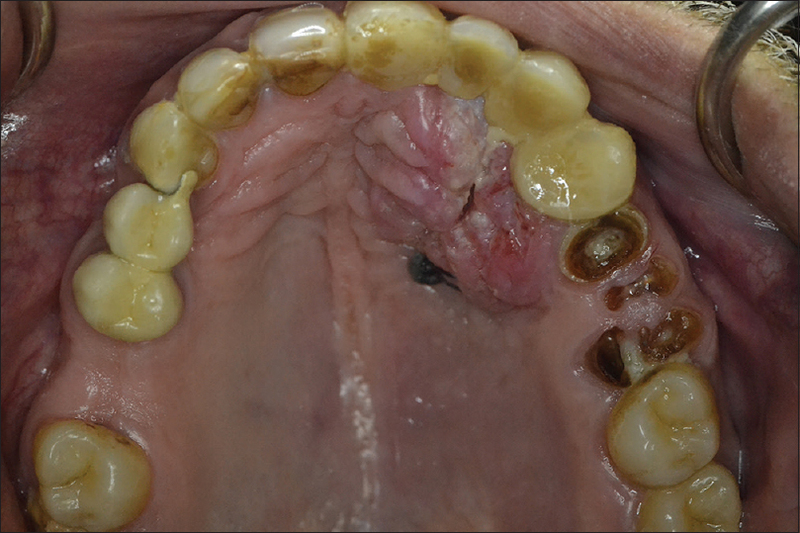 Purpose: This systematic review aimed to evaluate retention failures in cement- and screw-retained fixed restorations on dental implants in partially edentulous arches. 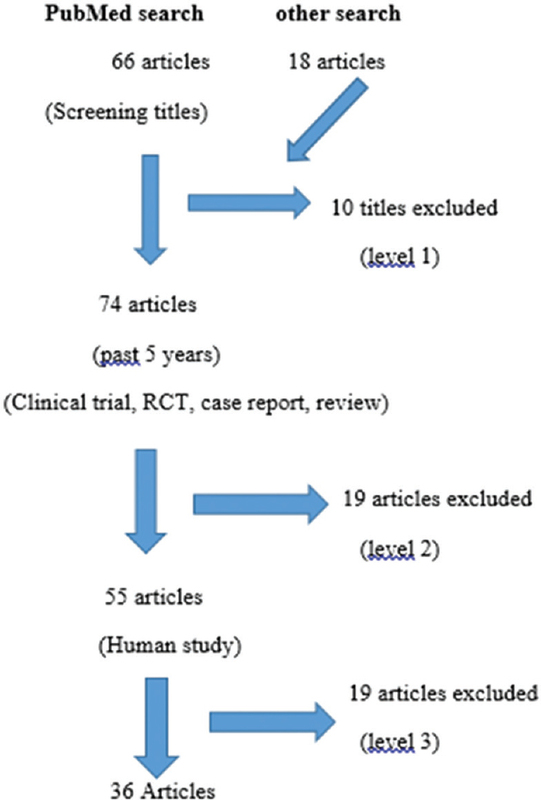 Methods: The relevant articles were retrieved from MEDLINE (PubMed), Cochrane Library, and EBSCO electronic databases for articles published from January 1995 to January 2016 and were restricted to randomized controlled trials and retrospective and prospective studies on human subjects that were reported in English. A further hand search was conducted on individual journals and reference list of the articles found. Reviewed studies which reported retention failures in fixed implant-supported prostheses using screw and cement retention mechanism. Information on the type and nature of restoration, as well as different luting cement, were also collected. Results: Thirty-three articles were finalized, 20 short-term clinical studies (up to 5 years) and 13 long-term studies (≥5 years). Out of 33 studies, 16 studies were included in meta-analysis, 8 in short-term and 8 in long-term studies. 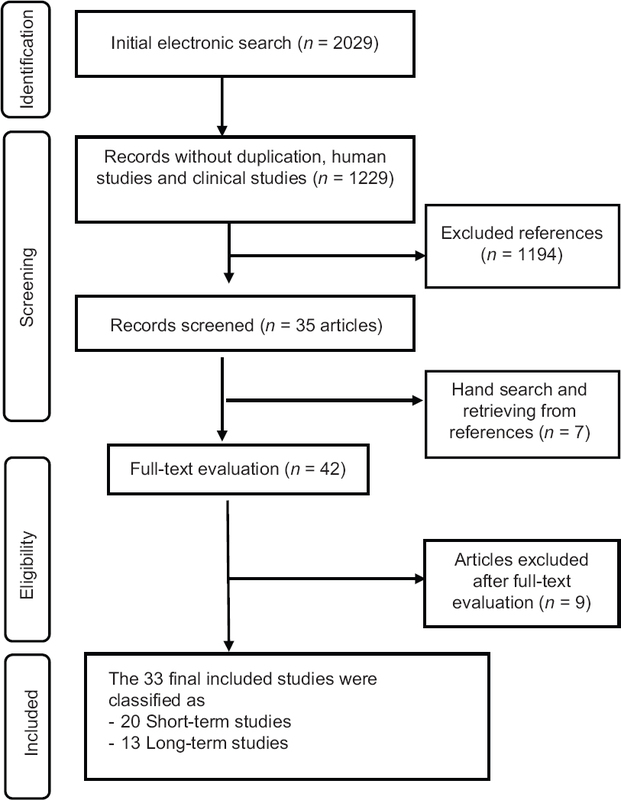 The results of the meta-analysis for short-term studies showed statistically significant difference between cement-retained and screw-retained prosthesis, with the forest plot favoring cement-retained prostheses (risk ratio [RR]: 0.26; confidence interval [CI]: 0.09–0.74; P < 0.0001; I2 = 79%). In long-term studies, the forest plot revealed statistically significant difference between both retention systems favoring cement-retained prostheses (RR: 0.31; CI: 0.13–0.76; P = 0.03; I2 = 56%). Conclusion: Analysis of the short- and long-term studies shows lesser retention failures with cement-retained prostheses when compared to screw-retained prostheses. Further, multicentric, high-quality randomized controlled studies with long-term observations and modified cementation protocols can yield higher grades of recommendation to avoid retention failures. Aim: The aim of this study was to compare the adhesion of glass-ceramic overlays to tooth structure, under the effect of shear forces, using different bonding systems. Materials and Methods: Thirty healthy lower third molars were selected and randomly allocated into three groups (n = 10). Group 1: overlays bonded to tooth structure using Panavia V5 with immediate dentin sealing (IDS); Group 2: overlays bonded using Panavia V5 without IDS; and Group 3: overlays bonded using heated composite combined with a bonding agent with IDS. All the restorations were made of glass-ceramic (Suprinity, Vita). The restored teeth were then stored in distilled water for 7 days and at room temperature. Shear forces were applied using a universal testing machine. Load and displacement were recorded at intervals of 0.1 s. A statistical analysis was used to compare the groups. Results: The mean resistance to fractures ± standard deviation obtained for the Groups 1, 2, and 3 was, respectively, 15.7440 ± 2.13, 12.0750 ± 1.41, and 8.33364 ± 2.85 MPa. The analysis of variance was highly significant (P < 0.001) allowing us to reject the null hypothesis of equality between the three groups. Comparisons between pairs also provided significant results. Conclusion: Bonding using Panavia V5 with IDS showed a better resistance to shear forces when compared to other bonding techniques. The application of IDS increased the adhesion. Background: Complaints with complete dentures is a common and expected phenomenon. However the type and character of complaint varies between population and is influenced by the socio economic condition, prevalent dental awareness etc. This study attempts to find the most common complaints with complete dentures, their causes and also presents a classification of the same. Method: A cross-sectional analytical study was conducted by performing a survey on a sample of population over an 18 month period utilizing a customized questionnaire. The complaints were divided into four categories viz. discomfort, retention, esthetics and miscellaneous. 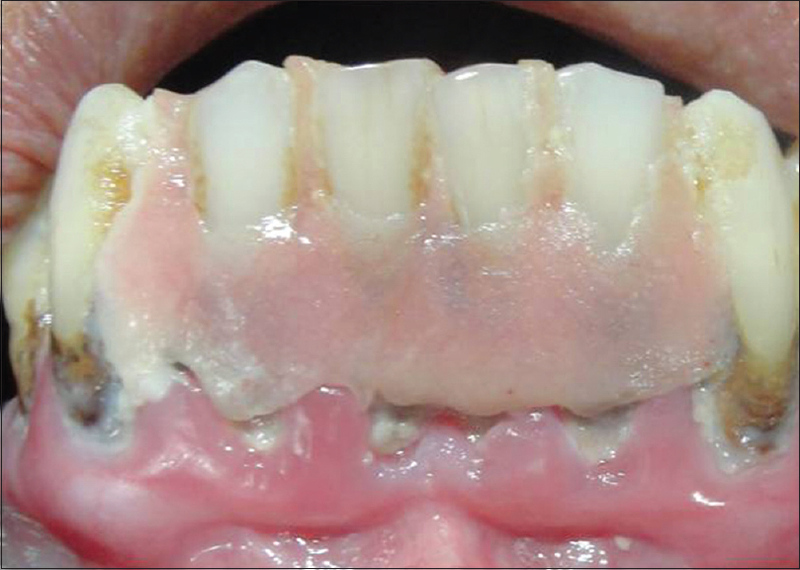 Consequently each denture was evaluated for structural and functional defects. The findings were classified into error in denture base, physiopsychological, error in occlusion and teeth selection. The data was statistically analyzed. Results: Error in denture base was the predominant cause of complaints. However physiopsychological and error in occlusion and teeth selection were also important second factors in certain groups of complaints. Highest number of complaints (23.07%) belongs to discomfort in mandibular posterior region. While the least number of complaints are concerned with speech as reported by both males and females (both at 2.02%). Conclusion: Discomfort with complete dentures was the largest complaint reported followed by loss of retention with esthetics and miscellaneous complaints. Discomfort in mandibular posterior region was the most frequent complaint reported while speech related complaints were least in number. 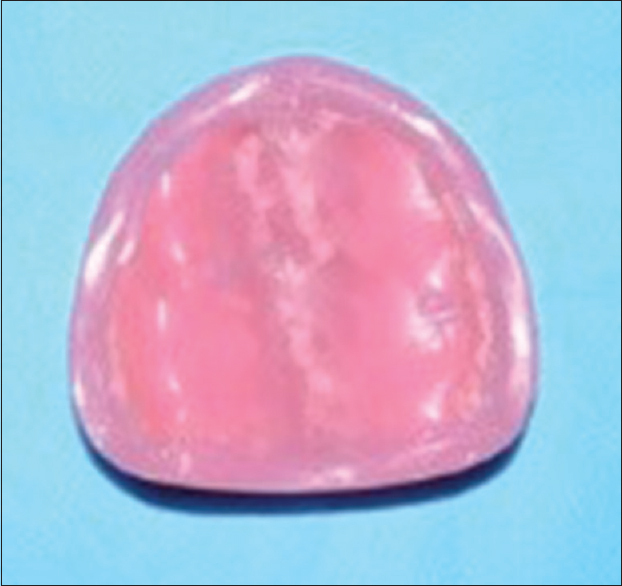 Most common cause of complaints was error in denture base. Statement of Problem: Various osteotomy modalities seem to have an impact on the primary and secondary stability of the dental implant. The available literature lacks the comparison of various available osteotomy modalities used for the dental implant placement and its effects on the initial surgical bone removal. Purpose: The purpose of this study is to compare and evaluate the osteotomy sites created using standard drill, bone trephine, and alveolar expanders for dental implant surgery. Materials and Methods: The study was done on ten goat hemimandibles. 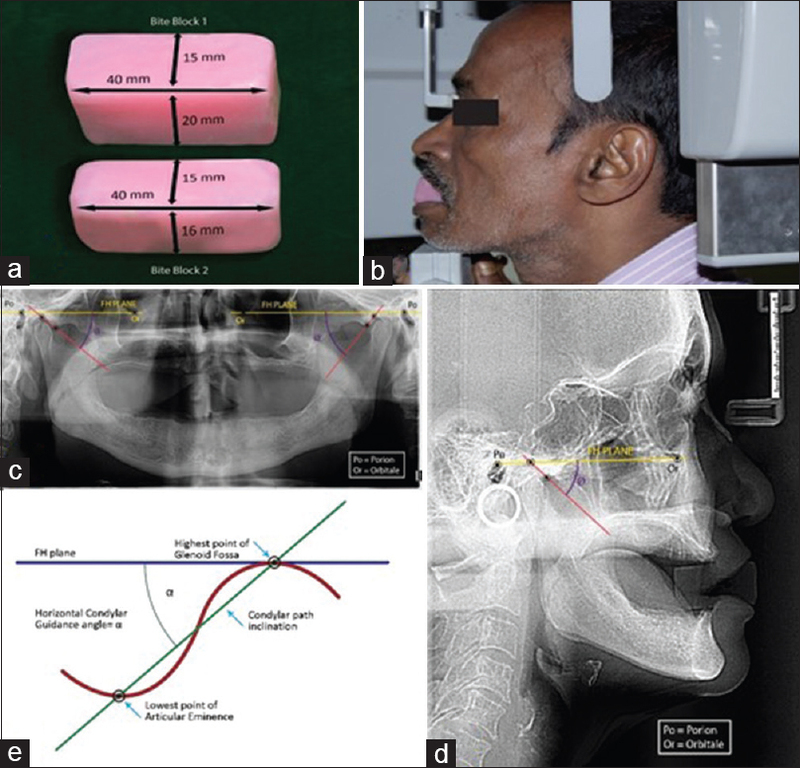 Three osteotomy sites were prepared at the inferior border of the mandible using standard drill, trephine, and alveolar expander in each hemimandibles and the sites were subjected to cone-beam computed tomography (CBCT). The CBCT images obtained were compared for the amount of cortical bone and bone marrow loss at osteotomy sites in different techniques. Results: The mean and standard deviation of loss of cortical bone with standard drills, trephines, and alveolar expanders was 3.62 ± 4.216 × 10−2, 3.6 ± 4.681 × 10−16 and 3.15 ± 7.071 × 10−2. At the middle-third region, the loss of marrow bone was 3.38 ± 7.88 × 10−2, 2.15 ± 8.498 × 10−2 and 0.03 ± 9.487 × 10−2, and at lower third region, it was 2.3 ± 4.714 × 10−2, 0.02 ± 6.325 × 10−2, and 0.0, respectively. Conclusion: CBCT images showed minimum bone loss with the use of alveolar expander which may be due to the lateral bone condensation rather the removal of the marrow. Trephine showed less marrow removal in comparison to the standard drill used for dental implant surgery. Purpose: Since the services of a qualified practitioner are not easily accessible to the vast majority of the population, the gap is filled literally at the roadside by the ubiquitous unqualified practitioner. The present article emphasizes on the outcome of prosthesis which the quacks deliver for the replacement of natural teeth. Materials and Methods: In the present study, we had explored the reason why people visit these quacks, the complications which they face after using fixed dentures delivered by the quack and some solutions to tackle quackery. 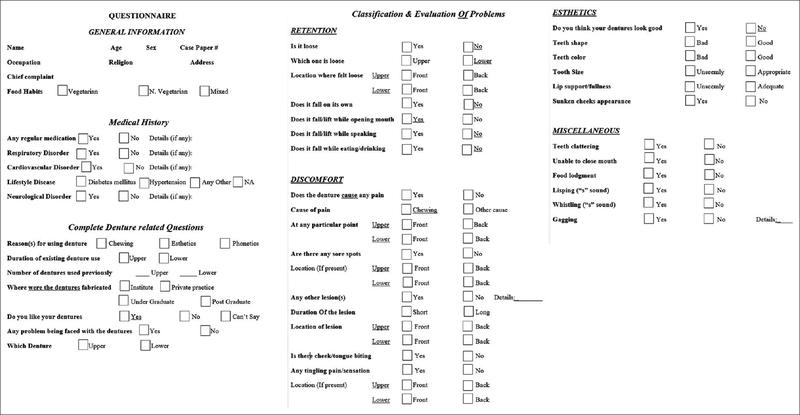 Data were recorded as a closed-ended questionnaire for 132 participants. Results: Nearly 64% of subjects were facing a problem with the denture and 74.2% of the participants were not even aware of any qualified practitioner. Most common reason to visit the quack was lack of awareness; other reasons were economy, proximity to house, comfortable fixed option, single appointment, and referrals. Conclusion: Awareness and orientation programs are possible solutions to spread knowledge, change attitudes, and practice. In addition to that, there should be strict laws abolishing the practice of unqualified practitioner. Background: Prosthesis misfit plays an important role in complications such as occlusal and abutment screw loosening and fracture in implant restorations. Reproducing the intraoral relationship of implants through impression procedures is the first step in achieving an accurate, passively fitting prosthesis to ensure maximum accuracy. Hence, splinting of multiple implants with most accurate material may be a valid option. Context: The results of splinting multiple implants are always inconsistent, and there is limited literature available to compare the accuracy of impression techniques as well as materials. In such situation, more and more studies have to be done to prove the efficacy and accuracy of each splinting materials. 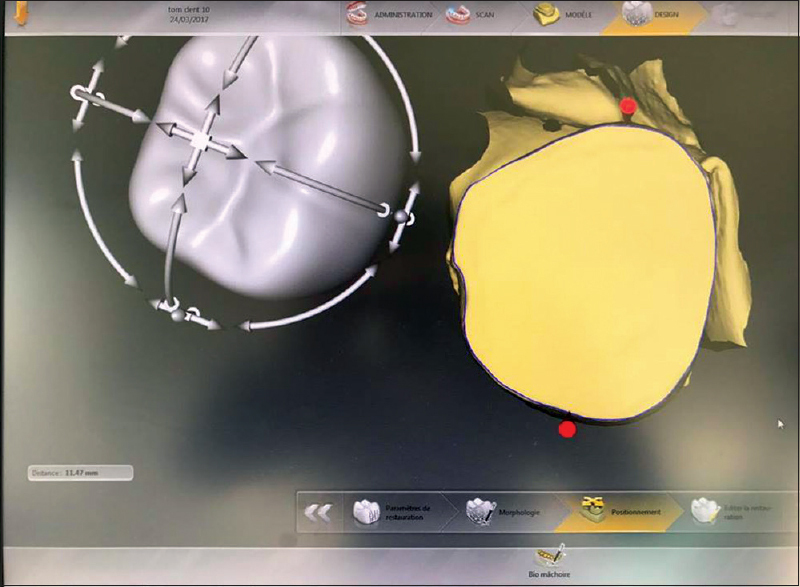 Aim: The aim of the study was to evaluate the positional accuracy in multiple implants using acrylic resin, pattern resin, flowable composite, and bite registration paste. 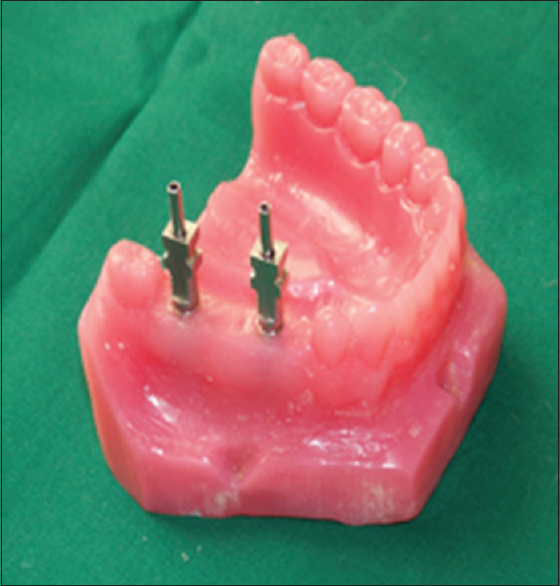 Subjects and Methods: An acrylic resin model was fabricated into which four implant analogs placed. The copings attached were splinted with dental floss onto which acrylic resin was added, which was sectioned and rewelded (Group A). Similarly, pattern resin, flowable composite, and bite registration material were added which were considered as Group B, C, and D, respectively. Impressions were made in vinyl polysiloxane and analogs were attached. The casts retrieved from each group were analysed for the positional accuracy of implants. Statistical Analysis: One-way ANOVA was done to analyze the significant difference between the four implant analogs of each group with the master model. The confidence interval was also calculated to assess the accuracy. Results: It was observed that all materials are equally effective for the accurate reproduction of implant positions. There was no significant difference between the centroids of implant analogues of master model and the mean of interimplant distance 1 and 2, 1 and 4, 3 and 4 and 2 and 4 in each group. The P-values were >0.05. The accuracy of splinting materials were analysed and it showed that splinting with flowable composite (Group C) as well as bite registration paste were in par with the conventionally used materials like pattern resin and acrylic resin. Conclusions: Results showed that flowable composite as well as bite registration material can be recommended as splinting material of choice for multiple implant cases, as these exhibited similar results like other groups (pattern resin and acrylic resin) which are conventionally used. Aim: The purpose of this study was to compare the wettability of saliva, a saliva substitute, and distilled water to three denture base materials. Materials and Methods: Thirty specimens of each denture base material: Heat cure polymethylmethacrylate (DPI heat cure), high-impact polymethylmethacrylate (Trevalon HI), and nylon (Valplast) were fabricated. The specimens of each denture base material were divided into three groups of ten specimens. 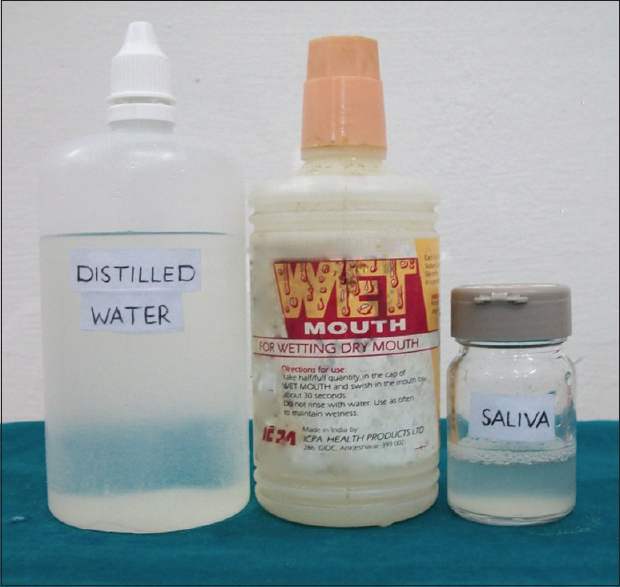 The advancing and receding contact angles of three media: a commercially available carboxymethylcellulose-based saliva substitute (WET MOUTH), human whole saliva, and distilled water, with each denture base material were determined using a goniometer. The contact angle hysteresis was calculated as the difference between the advancing and receding contact angles. The data were statistically analyzed using univariate analysis of variance and Duncan post hoc test. Results: Low-advancing and receding contact angles were demonstrated on high-impact heat-polymerized polymethylmethacrylate denture base material. Highest hysteresis values were calculated for nylon denture base material. Conclusion: Best wettability was demonstrated on high-impact heat-polymerized polymethylmethacrylate denture base material. 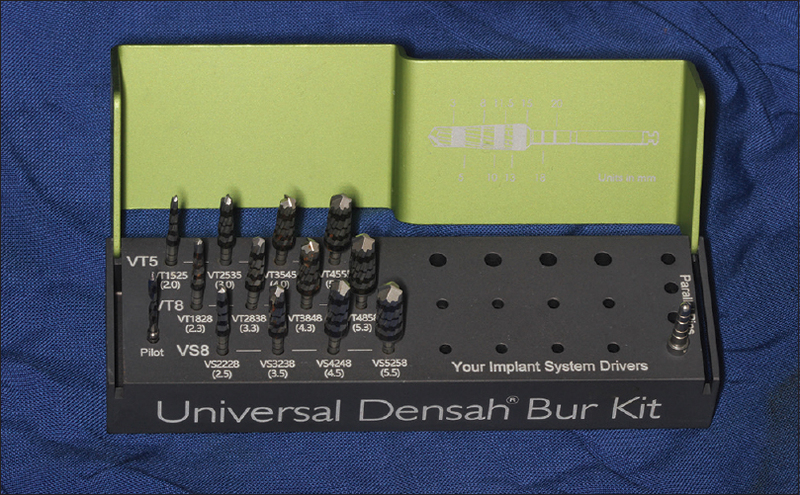 Based on the high hysteresis values calculated with nylon denture base material, it would possibly provide better denture retention. Objectives: The present study aimed to evaluate flexural strength of hydrogen plasma-treated polypropylene fibers-reinforced polymethyl methacrylate (PMMA) polymer composite. Materials and Methods: One control group with no fiber reinforcement and 9 polymer composite test groups with varying fiber weight percentage (2.5, 5, and 10 Wt%) and aspect ratio (3/220, 6/220, and 12 mm/220 μm) were prepared. Flexural strength was measured using Instron. Results: All hydrogen plasma-treated polypropylene fiber-reinforced test groups obtained significantly higher flexural strength characteristics. Among the test groups, 6 mm long fibers reinforced in 10 Wt% showed superior flexural strength. Conclusion: Hydrogen plasma treatment on polypropylene fiber has a significant role in enhancing the adhesion between PMMA polymer matrix and the polypropylene fibers and thereby the flexural strength. 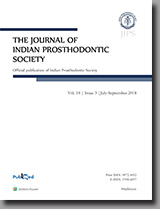 Purpose: The aim of the present study was to evaluate and to compare the accuracy of implant casts obtained by open tray pick-up impression technique using 2 types of custom-made trays and a specialized aluminum stock impression tray. Materials and Methods: A heat-cure acrylic resin master model was fabricated. Two implants were placed parallel to each other. Ten impressions were made from each group. Polyvinylsiloxane impression material with single step putty wash technique was used for making all the impressions. The resultant casts obtained were compared to the master models with respect to the distances measured between the reference points using a stereomicroscope. The data obtained was statistically analyzed using one-way ANOVA, Tukey's post hoc procedures, and t-test. Results: Mean value obtained was 2.012967 cm (±0.007060) for corimplant stock tray, 2.012627 cm (±0.007945) for autopolymerizing acrylic resin tray, 2.010279 cm (±0.006832) for light-cure hybrid composite tray. P value was calculated to be >0.05; hence, there was nonsignificant deviation of observations from standard value in each group. Conclusion: Statistically insignificant difference was found between the accuracy of casts obtained by the different impression trays. However, light-cure hybrid composite trays showed best results followed by autopolymerizing acrylic resin trays and Corimplant stock tray. Context: Probiotics have been prescribed to old aged patients' invariably with or without complete dentures for improving their digestive process. It is mentioned that probiotics do have an effect in increasing the amount of saliva in the oral cavity. Therefore, this study was planned to evaluate the amount and pH of saliva after using probiotics for 60 days in completely edentulous patients. Aim: This study aims to evaluate the amount and pH of saliva of edentulous patients before and after using probiotics. Settings and Design: The interventional prospective study was conducted at the department of prosthodontics of the institute. Methods: The study was conducted on edentulous patients. The whole unstimulated and stimulated saliva was collected at baseline and amount, and pH was measured. 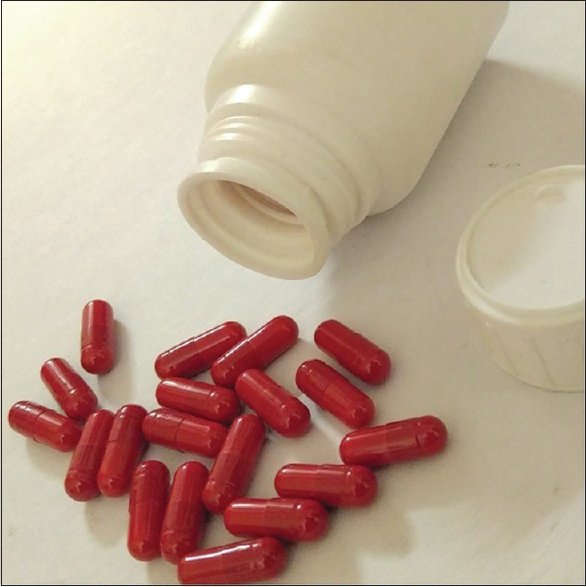 Then, each patient was given probiotic capsules reaching 3.3 × 107 CFU/g to consume daily once for 60 days. Saliva was recollected from patients, and its amount and pH was calculated and compared with baseline. Statistical Analysis Used: STATAIC-13. Results: On comparison of saliva before and after consuming probiotics, there was an increase in the mean unstimulated and stimulated saliva from baseline to that after 60 days, the difference being 0.406 and 0.433, respectively. The difference was statistically significant with P < 0.001. The mean pH at baseline was 7.818 ± 0.231 which increased after 60 days to 7.825 ± 0.189, the difference being 0.007. Conclusion: This study concluded that probiotics increase the amount of saliva of completely edentulous patients and so it can be helpful in patients suffering from xerostomia/hyposalivation. Rehabilitation of a partially dentate postmaxillectomy patient using a novel approach is presented in this report. The patient was referred to our practice by the oral and maxillofacial surgery department of the local general hospital for the evaluation and prosthetic treatment planning. He had undergone biopsy for a lesion located in the right quadrant of his maxilla and was scheduled for a hemimaxillectomy for removal of a squamous cell carcinoma. A surgical obturator was prepared for placement at the time of ablative surgery. Following completion of adjuvant radiotherapy and chemotherapy, a digital intraoral impression of the remaining maxilla and mandible was obtained, and a computer-aided design/computer-aided manufacturing obturator removable partial denture utilizing a selective laser melting -produced metal framework was fabricated and delivered to the patient to restore function and esthetics. The need for conventional impression was eliminated leading to a reduction of necessary appointments and more comfort to the patient.